Reposting from my entry via CBinsights . You can follow me @samirkaji for more of my thoughts on VC and tech. Although it’s been less than a year since I posted my primer on the Micro-VC market, there have been a lot of developments since then. Over the past 18 months, I’ve met with over 150 Micro-VC managers of all sizes, geographies, and investment themes. Before I attempt to prognosticate where I think the Micro-VC market is headed, I want to share some of my recent observations. The table below, leveraging data from CB Insights along with SEC filings, displays the growth in the number of Micro-VC firms over the past five years. 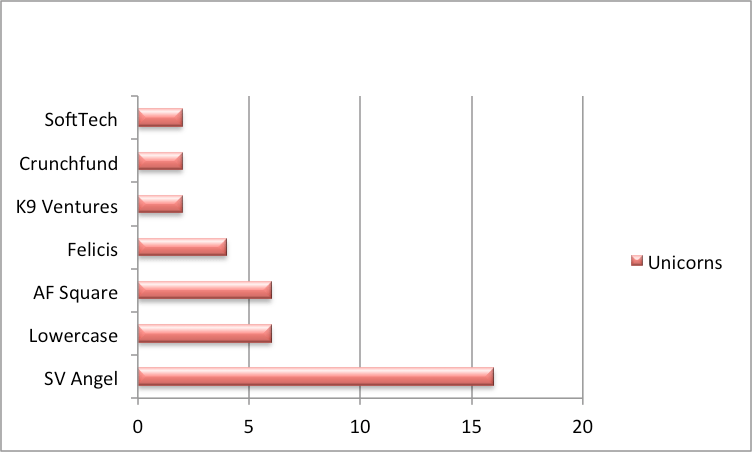 -Of the 236 firms identified, approximately 50% have not raised a fund over $25MM. This number isn’t really shocking given the low barrier of entry at this size – the majority of these funds of this size are closed without any traditional institutional LP backing. -Over half are located in Silicon Valley, with NY, LA, Boston accounting for just under a quarter. As noted above, nearly half of Micro-VC firms have little to no institutional LP capital. Institutional capital for the Micro-VC Market includes Endowments, Foundations, Corporates, and Fund of Funds. With respect to Fund of Funds, many institutional Fund of Funds have been quite active over the past couple of years in Micro-VC, including firms like Venture Investment Associates, Cendana Capital, Sapphire Ventures, Weathergage Capital, Horsley Bridge, Northern Trust, SVB Capital, TrueBridge, Greenspring, Legacy Ventures, Next Play Capital, and Top Tier Capital to name a few. Although many allocators are still exploring new Micro-VC managers, many have already placed their bets in the space, and the rise in numbers of new funds coming to market has made it virtually impossible to separate signal from noise. Due to capital constraints, Micro-VC funds often struggle to take advantage of valuable pro-rata rights in future rounds of their most promising portfolio companies. As a remedy, Micro-VC managers are now very actively forming SPV’s to enable pro-rata investing in top performing portfolio companies. Keep in mind that SPV’s don’t solve for fund level economics, but offer LP’s the ability to participate directly into portfolio companies at on reduced, albeit deal by deal economics. Thus far, most have been done through offline channels, but we’re starting to see increased use of platforms such as AngelList (syndicates) for SPV’s. -Pre-seed ($500K-$1MM) – Good management team/market/solution, little traction. -Seed ($1MM-$2MM) – Good management team/market/solution, early evidence of product-market fit and traction. -Post-seed ($2MM-$4MM) – Same as above, but with fairly significant evidence of product-market fit and tangible business specific traction metrics. Over the past year, many Micro-VC’s have continued to migrate toward seed and post-seed investing. This trend has resulted in a challenging supply/demand environment for pre-seed companies seeking institutional capital, and perhaps not as intuitive, has created a higher bar for follow-on financing for companies that have raised large post-seed rounds. To expand, most lifecycle investors today juxtapose companies that have previously raised large post-seed rounds via a similar lens as companies that have previously raised small A rounds, and therefore grade to Series B level metrics. With the prior two points in mind, many 1st generation Micro-VC’s have gradually grown fund and team sizes. Firms like Data Collective, Felicis Ventures, and SoftTech VC have fundamentally evolved into more conventional multi-stage investors that aim to drive value across all stages of development. -In 2015 alone, nearly 50 US companies have raised rounds in excess of $100MM. -Over the past 3 quarters, 51 companies have joined the “Unicorn” club. These growth rounds have created substantial performance bumps in the portfolios of Micro-VC firms. Most Micro-VC firms raising capital today maintain very persuasive performance metrics for recent vintages. I’m regularly seeing Vintage 2013 Micro-VC funds that have net IRR’s >25% and MoIC’s (multiple on invested capital) of 1.5-2.5x. While these largely unrealized numbers are compelling, they represent table stakes for managers hoping to raise in the current market. Contrary to what some have posited, Unicorns (or more accurately, liquid unicorns), are essential for alpha returns – which is a 4X+ net return of capital. Here is a sampling of Micro-VC’s that have invested in >1 Unicorn. SV Angel leads the pack with 16, although important to note that their velocity based investment model provides for some skew. In addition to the presently 236 active Micro-VC firms, I’m currently tracking nearly 30 firms that are raising freshman funds. 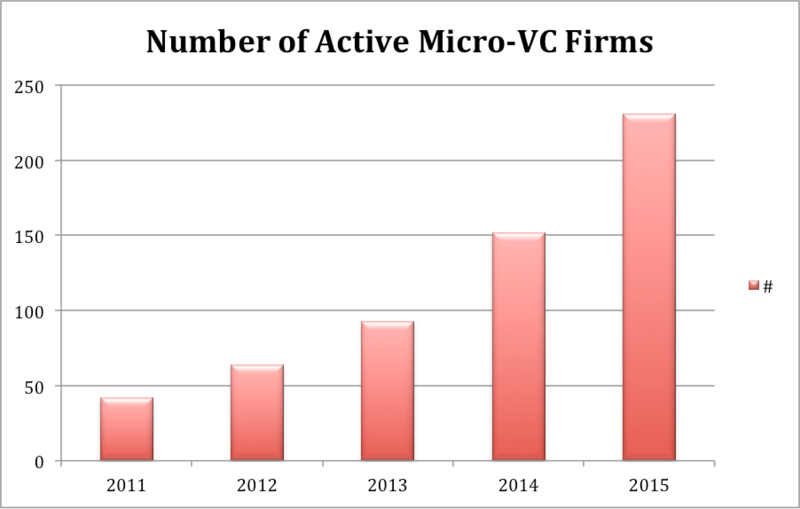 My expectation is that we’ll continue to see expansion with the number of active Micro-VC firms peaking around 350. From there, I anticipate a steady contraction of active Micro-VC firms, with no more than 150 in 2018. -Unstable LP bases – As mentioned, nearly 50% of funds are <$25MM. The majority of those funds have LP’s that are non-institutional in nature. If history serves a an accurate proxy, non-institutional LP’s, particularly small family offices and HNW individuals tend to be unpredictable follow on fund investors, particularly given the unlikely nature of significant distributions over the next few years, and the looming threat of a potential market contraction. -Graduates – As covered above, several-branded Micro-VC’s have gradually transitioned to full stack venture firms. -Exits continue to get pushed due to the abundance of late stage capital. -Risk Mitigation – While firms could sacrifice upside by selling early, the specter of high flyers getting their wings clipped looms as a real risk. Amplifying risk are massive preference stacks, dangerous for Micro-VC’s if some of these companies end up liquidating for amounts equivalent or less than total capital raised. For GP’s and founders alike, I’d highly recommend Heidi Roizen’s blog post around the capital stack. While the majority of first generation Micro-VC firms are seed stage generalists, the raw number of firms has highlighted the importance of demonstrating differentiation through domain expertise, network, or brand. Micro-VC firms are primarily structured as standard close ended, 2/20 structures. Even most SPV’s are done through offline channels. I’m expecting an exponential growth in the use of online platforms such as AngelList by institutional investors, both as a preferred avenue for SPV activity, but as a viable alternative to raising a traditional fund, particularly as data and network functionality emerge. Over 200 accelerators exist globally today, and sell insight, community, and validation as value drivers. However, with the rise of co-working spaces and meet-up groups along with ubiquity of information, the notional value of pure accelerators has been declined, and best accelerators have become Micro-VC’s (500 Startups, YC, Lemnos Labs, MuckerLabs). I’m anticipating a huge drop in the number of pure accelerators in the next 24-36 months. Thanks to CB Insights for the data and @Rohitkjain for culling through it.